By simply sliding the wireless display out of the Fluke 233/A’s meter body, the technician can place the display where it is most easily seen—up to 10 meters (33 feet) from the point of measurement—while putting the meter in the best position to take measurements. The removable display has a magnetic back and flat bottom so it can be mounted or placed on any flat surface where it can be conveniently seen. When the display is attached to the meter body the Fluke 233/A operates as a conventional multimeter. Find a comfortable position to view and record test data, even when the test location is hard to reach or in a dirty or noisy environment. Attached test leads to brake lights while sitting in the driver seat, pressing the brake pedal and viewing the display. Safely view underhood measurements on moving vehicles. Separate the tasks of positioning the meter and reading test results, devoting full attention to each job—and working more safely. 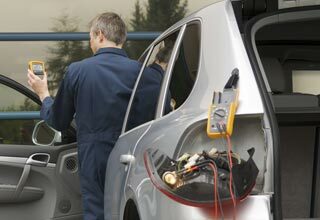 Run tests and read results at a safe distance from high-voltage, high-current systems. The Fluke 233 is safety rated for use in CAT III 1000V, CAT IV 600V working environments, important for technicians working on hybrid vehicles. Designed by Fluke engineers and manufactured at the Fluke Worldwide headquarters in <?xml:namespace prefix = "st1" ns = "urn:schemas-microsoft-com:office:smarttags" />Everett, Washington, the Fluke 233 is safety rated for use in CAT III 1000V, CAT IV 600V working environments. This is important for technicians working on hybrid vehicles, which routinely work with high-voltage, high-current systems not found on conventional vehicles.